Oh No! It is too late! Well, it happened. Just about when I was ready to get the .com domain for Inkspeare, which has been available for some time, someone in France just scooped it up; what a bummer! When I tried to search for the “Inkspeare” website with the .com domain, it does not let me in to view it. The Bing description appears as “We would like to show you a description here but the site won’t allow us.” When clicked, it appears as the domain has been registered to a hosting site, and is now parked by the owner. Boohoo, it took so late for me to decide to get it, and now, it doesn’t make sense for me to get the .ME, because really, wordpress.com sounds so much better, than .ME. Anyone knows why would someone park a domain? It puzzles me and makes me wonder. Uh, but enough of lost domains; it is Watercolors Friday, and today, I want to celebrate the mundane. Yes, the mundane and how we can make it sparkle. 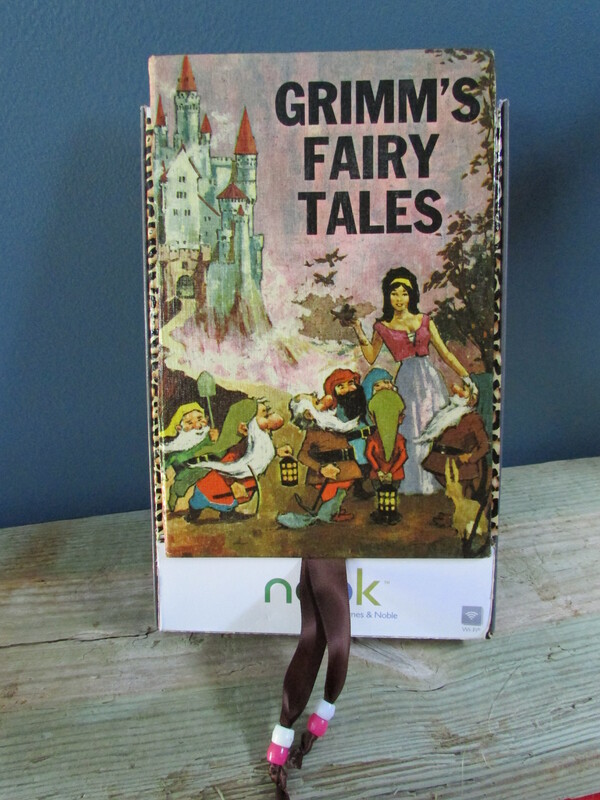 Recently, my husband gave me a Nook, which I have to say I totally love, but I did not have a case for it. Then, I realized that I loved the box that came with it – a sturdy box that would make the perfect case if it wasn’t so mundane. Well, I decided to try to change that, since I really liked the box, mostly because it had the perfect space for the charging cord. I took on the mission to make it look like something I would love to look at, and delight myself in opening when going to use the Nook. I thought about it, and this is what I did. I covered part of the inside with decorative tape (leopard), and part of the outside as well. 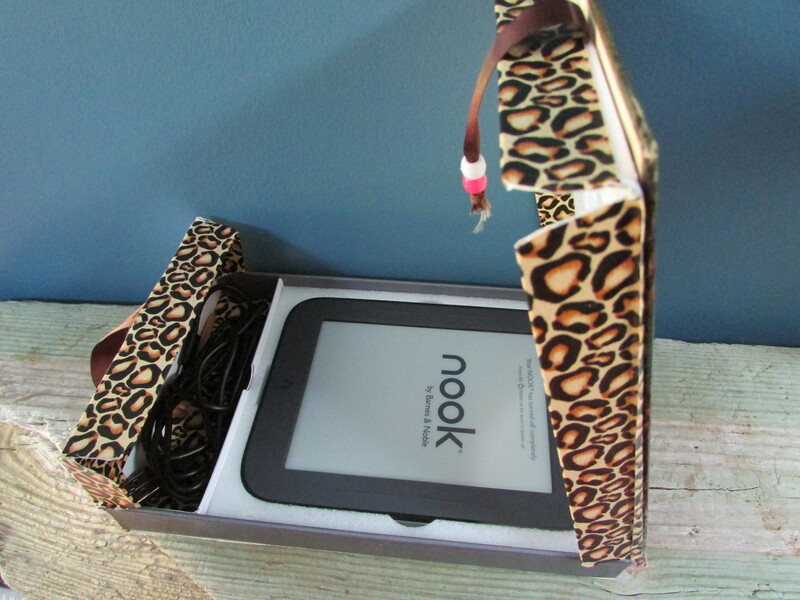 Then I took ribbon and beads and fastened them using the same tape so I could open the box by pulling it for the two sections – the nook and the charge cord. 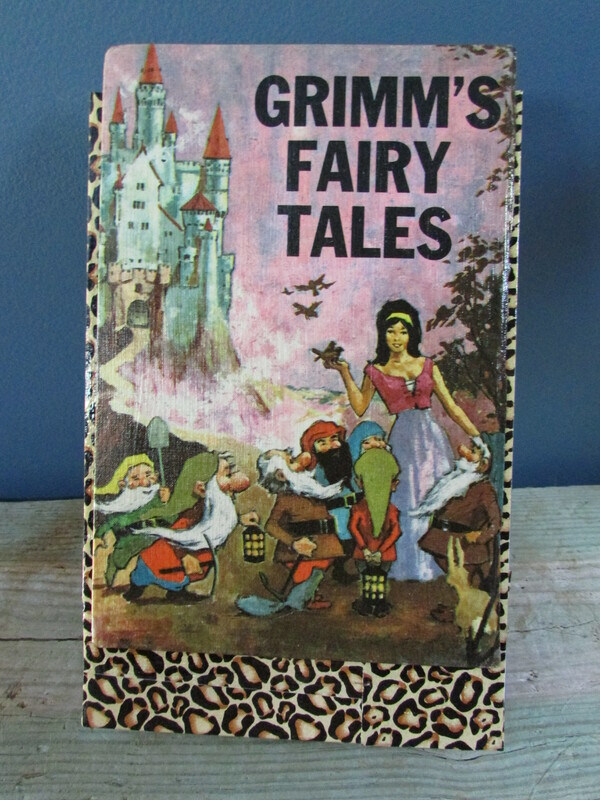 After that, I took a vintage copy of The Grimm’s Fairy Tales, and removed the covers. I attached them, front and back, and glued/glazed the thing with Mod Podge to make it strong and durable (It hardens and protects). This is the result, and I am happy with it. If you have visited this blog, you know that I try the green solution first. In picture order – inside, front, and back. UPDATE 2 – I have to say, that after thinking about it these couple of days (even after unplugging myself), I made the decision to get the .ME domain, so Inkspeare will now be Inkspeare.me. Although my first choice was the .com for obvious reasons – everyone looks for a .com first, when searching; it is almost a reflex – I think that a .ME would be easier to remember than a .net or .org, or any other variations. A comment by Roxana suggested that it is more personal, and I happen to agree. Besides, the original .wordpress.com will still work if someone searches for Inkspeare that way, or click in any of the live links I have all over, so there is no harm done. I still like the .com better, but that domain is parked by someone so it is not available right now. However, I am happy with my decision of purchasing the .me domain. Sorry to hear that the .com has been snaffled (as you probably already are aware .co, .net, .org and .info are still out there) . Moving on swiftly; Dad used to live on Shakespeare Avenue when he was my age but didn’t write a jot! Thanks for your writings (and your occasional reading) anyway. Wow, the cover is amazing! 🙂 Love it!